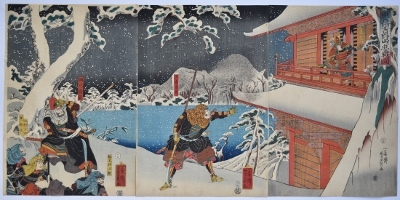 The battle in snow at the Go-ju-no Pagoda on Mt. Yoshino. 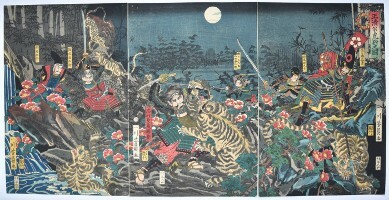 Sato Shirobyoe Tadanobu, a follower of Minamoto no Yoshitsune, swiches armour with Yoshitsune to do battle with the warrior monks led by Yokogawa Kakuhan. 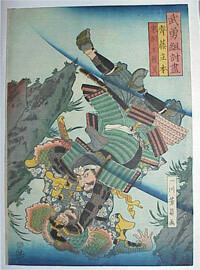 Published 1858 by Maruya Jinpachi. Extremely fine impression with extensive splashed and sprayed gofun. Fine impression and condition. 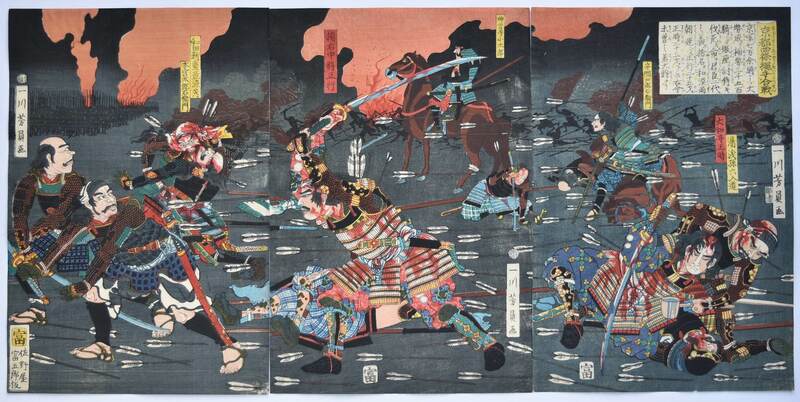 Signed Ichijusai Yoshikazu ga.
A triptych showing the battle of Shijo Nawate at Yoshino, Nara. Shows Kusunoki Masatsura of the Southern army in the centre amidst a hail of arrows battling the Northern armies in 1348. He was killed in this fight at the age of 22. Published by Sanoya Tomigoro, 1862. Very good impression and colour. Very slight trimming, otherwise very good condition. 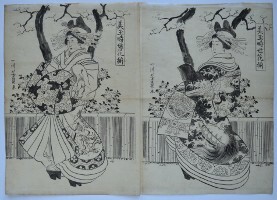 Signed Ichikawa Yoshikazu ga.
Watanabe no Tsuna; Usui no Sadamitsu; Urabe no Suetaka, and Sakata no Kintoki. Published by Maruya Jimpachi in 1858. 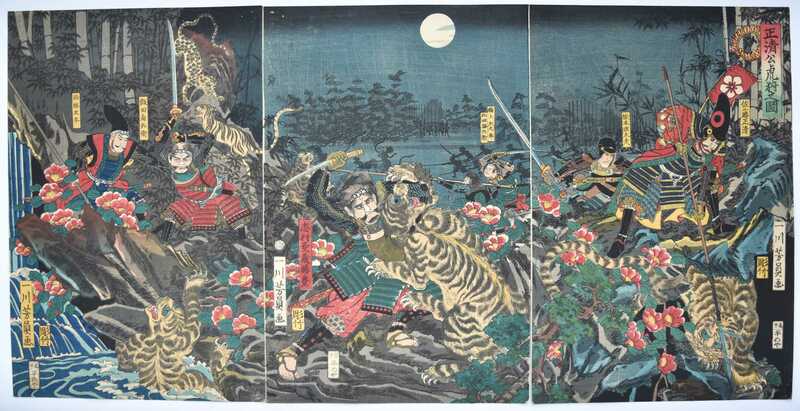 Yoshikazu was a pupil of Kuniyoshi who also designed a version of this story. A fine design. Very fine impression. 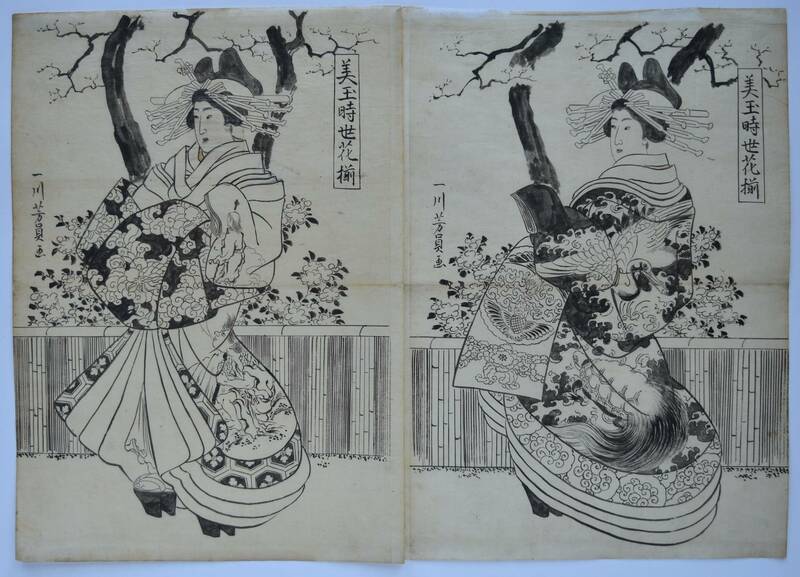 The first and second sheets do not match accurately and the colour changes from black to brown. The cataloguer has noted this on every impression he has seen. Fine colour and condition. Signed Ichijusai Yoshikazu ga.